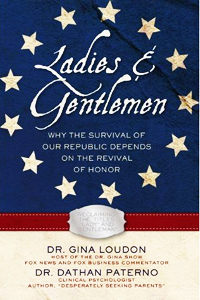 Dr. Gina Loudon has two master’s degrees and a Ph.D. in psychological fields. She is the co-author of “What Women Really Want” and is the host of “Smart Life with Dr. Gina” on the Money Business Life Network. She is a frequent commentator on Fox News and the Fox Business channels. She lives in San Diego with her husband and five children. Dr. Dathan Paterno is a fully licensed clinical psychologist, serving as owner and clinical director for Park Ridge Psychological Services, a private group practice in his hometown just outside of Chicago. His 20 years of experi­ence in the mental health field include work in inpatient psychiatric hospitals, therapeutic day schools, residential treatment centers, two private practices and a position as adjunct professor of psychology. The author of the well-received parenting book “Desperately Seeking Parents,” he is on the board of direc­tors of the International Society for Ethical Psychiatry and Psychology, a think tank and advocacy group of mental health profession­als committed to holistic and humane treat­ment of emotional disorders.